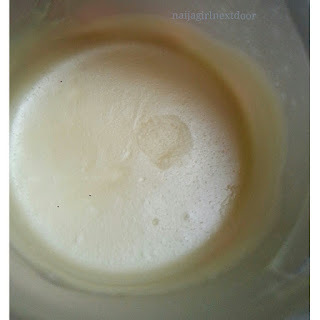 This post goes out to Gbemi (not you Gbemisola Jones) who dropped a comment asking for a post on how I made my diy cocoa butter cream. This post was somewhere in the works but she's the reason it's out now. Nigeria's number 1 butter has to be shea. Everyone knows Ori. In fact I knew Ori from childhood, long before I knew it was the same shea butter they were pronouncing on tv like it's one oyinbo thing. I got curious though, about other less commonly used butters: cocoa, avocado, mango, murumuru, kokum etc. I watched YouTube vids and searched Google to get more information about their differences and decide if I really needed to try any other. You know how I am about products- very skeptical. Top of my list to try was Avocado butter because it's said to be a soft butter that needs no whipping; and because of its reported mild, pleasant scent. The smell of (yellow) shea doesn't bother me much but no one would describe it as pleasant. Contains high levels of antioxidants like vitamin E and CMP to fight free radicals and premature aging; also locks in moisture, smoothes scars, heals dry skin, evens skin tone. You can read more about its contents and skin benefits here and here. Note: if you have acne prone skin, do not use it on your face. It can clog pores and worsen acne. Not a concern for dry skin like mine though. Heals dry itchy scalp, effectively seals in moisture, improves elasticity and therefore reduces breakage, softens and conditions hair, thickens strands, delivers shine. Some have reported a reduction in greys too. Even internally, cocoa butter's antioxidants work from the inside out to fight free radicals and hence aging. It may even reduce the chances of some cancers. However, it is very calorific so if you're trying to lose weight, take tiny amounts of dark chocolate. 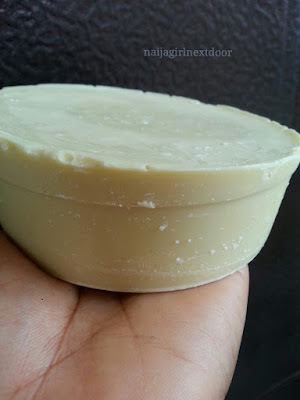 Raw cocoa butter is HARD at room temperature. Harder than shea. Harder than retrieving diplomatic passports from unauthorised former officials in this country. You can knock hard on its surface and you'll hurt your knuckles before you indent it. You can hold it in your hands like a new bar of soap. Shea would stain your hands if you did that, but not cocoa. Imagine having to deal with this everyday. You'll have to keep knife, grater, and maybe a fire source on your dressing table. Mother will be horrified (read this in your poshest British accent. Hoity toity). Favourite carrier oils- I used coconut, jojoba and sunflower. Olive oil would have made it too but I'm out. Step 1- melt the cocoa butter over a bowl of hot water. You can grate the quantity you need or just cut with a knife if you're not that patient (raises hand). Once the butter becomes liquid, it's time for step 2. You know I don't measure stuff, but how much oil you use depends on the consistency you want. Since it's rainy season and therefore hot and humid in Lagos, I wanted a lighter cream so I was liberal with the oils: almost equal volumes of oil (total) and cocoa butter. Step 3 - let cool then add essential oils. You don't want to add essential oils while there's still some heat in your mixture. It can denature them. Allow to cool for about 5 minutes then add. I used about 5 drops of Rose oil for this small batch. Step 4- Pour into a container and allow to set. I left mine this way because I wanted it creamy, but you could whip yours after it has set if you want an airy, moussy feel. Another way to do this is to skip the melting altogether and grate the cocoa butter, then put in a blender with the oils and blend up some cocoa butter mousse. This cocoa butter cream has a different feel from shea butter cream or whipped shea. Cocoa applies like a light oil while shea is waxy. For my second batch, I mixed shea and cocoa butters as I had a little bit of raw shea lying around. See those shavings at the bottom? 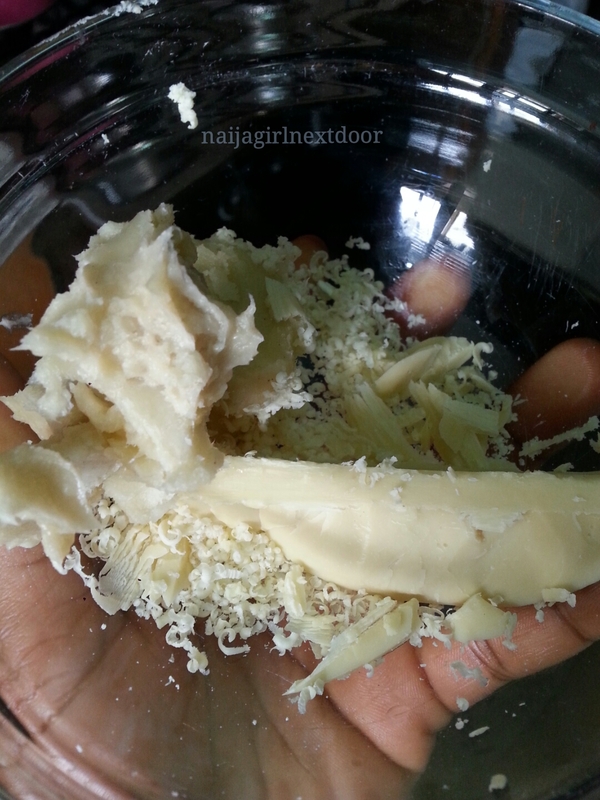 I started grating the cocoa but I got tired jare, and cut a piece with a knife instead. 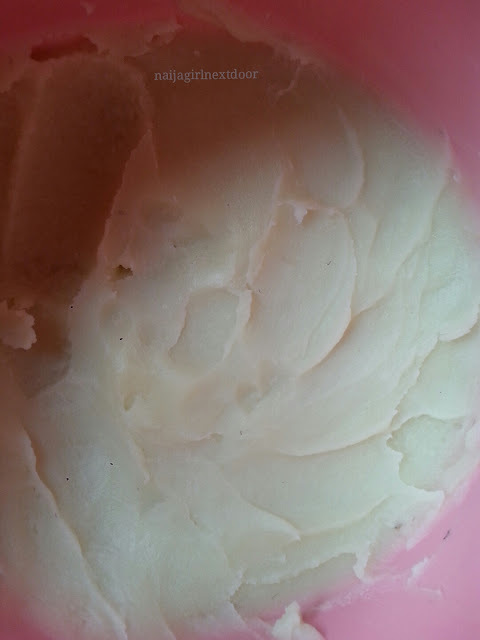 The soft lump there is shea butter. The rest of the process was the same. See how it looks noticeably waxier than the pure cocoa cream? I use this on my hair to seal in moisture after washing and applying leave-in conditioner or after daily moisturising with water spritz. I also use it on my body everyday as well as my face in tiny amounts. Somebody say bright skin. Commercial lotions and creams were the first and easiest to give up on my journey to natural, organic living. Update: also available on the The Africa Naturalistas store. Now on to cocoa butter's sister from the same momma: pure unsweetened cocoa powder. I always keep some on hand for chocolate cake. I recently read about its benefits to skin: it is also chock full of antioxidants and unlike the butter, is fine for acne prone skin. I'm hoping to do a chocolate face masque today. Have you tried cocoa butter? How do you use it? And cocoa powder? I'd love to hear your thoughts. Haa, Sandra, you left us out. 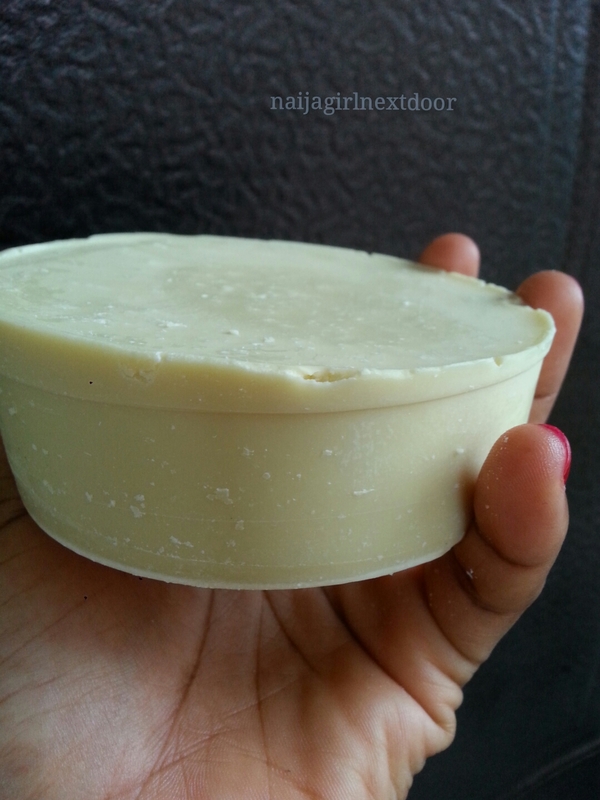 We sell African Naturalistas Cocoa butter on africanaturalistas.com/ourstore. Oya, add it to your link o. Am so trying this out. hope its not too late to do my bag tag post *covers face* forgive me girl. Ooo the bag tag! Lol. Please go ahead and do it, it's not too late. I've had a tag pending for longer than that myself. I heard it makes some people darker when used on the skin of course that's why I stayed away. Maybe I'll give it a try.. I heard that too. Also heard the same about coconut and olive oils, aloe vera etc My honest opinion? Notice the trend. It's always said about natural, non-bleaching skincare agents. I'm willing to bet the people who started these rumours were used to lightening creams and seeing their colour fade. Yaaaay. Thank you. Going to get me some soon. I use and love cocoa butter for 2 major reasons. The smell and the lightness. But the thing can turn to stone sha! Ahn ahn! Even the one I mixed with shea butter is difficult to maneuver once it's in an air conditioned room for too long. I think I'll try it your way instead and add oils too. Can I use shea butter instead as I don't know where I can buy cocoa butter in South Africa? Yes you can totally use shea butter for virtually anything that calls for cocoa butter. It's a great sealant, twisting butter, body butter etc too.